A friend asked me what the movie I was going to see was about. “A man is killed. He reincarnates as a fly. He seeks revenge”. They seemed unconvinced but Eega really is wonderful. Despite word of subtitled prints, we knew wouldn’t get them in Melbourne. Luckily fly is a universal language, and we are always up for an adventure without subtitles! Nani (Nani) is in love with Bindu (Samantha). Sudeep (Sudeep), a local tycoon and possessive psycho, decides he must have her so he kills Nani. Fate intervenes and Nani is reborn as a fly, eventually recovering memories of his past life. He sets out for revenge and to protect Bindu. This may sound silly, but it is a tribute to writer/director SS Rajamouli and his cast that I absolutely went with it and was caught up in the drama, the action and the hi-jinks. I had reservations about the post-reincarnation relationship as clearly Bindu had not moved on and it was never going to work despite the fact that she could see his inner beauty – he’s a fly, she’s a human…Yes I became emotionally invested in the love life of a CGI insect. Nani is good in his role. Because the basic plot was well publicised, I did feel like I was waiting for him to die. I really like Nani (the actor), but his role in the story limited my interest in his character. While human Nani showed charm and some skills, the fly was simply amazing. He knew engineering, physics, ballistics and who knows what else. He also retained his penmanship, using Bindu’s fallen tears to write a message (presumably ‘Hey it is me! Nani!’) He was the real hero with all the trappings. Eega-Nani had a training montage as he built his strength up in a gym made of household objects, he had a victory dance, and he had right on his side. The fly’s character developed over time as he became tougher, more lethal, and better at turning a disadvantage to an advantage. I like the decision not to give him a voice so all his communications were via gesture or charades. The animators did a superb job of making him very expressive but still a housefly. I suspect Eega-Nani and Bindu had some written exchanges off camera as I am not sure mime would have conveyed the more complex elements of their scheme. He wrote a very clear death threat to Sudeep as well so he had good communication skills. Samantha is lovely as Bindu. Her flirtation with human Nani was mostly carried out through facial expressions and she was really good, with excellent comic timing. She was also quite convincing in sadder scenes. Considering most of her scenes were with a CGI fly, she does very well to make it ring true. While Bindu’s back story seemed flimsy at best, she seemed nice and actively tried to do good through the NGO she ran. Her hobby of micro-art came in very handy when Nani needed teeny tiny equipment and weapons. The partnership also kept their fledgling romance alive which was sweet and yet all wrong (with him being a fly and all). Speaking of creepy – Sudeep. From suavely unpleasant kingpin, through a spiral of aggravation and irrational behaviour to outright craziness, Sudeep was hilarious and scary. He had a gun wall in his home so that was an early sign. 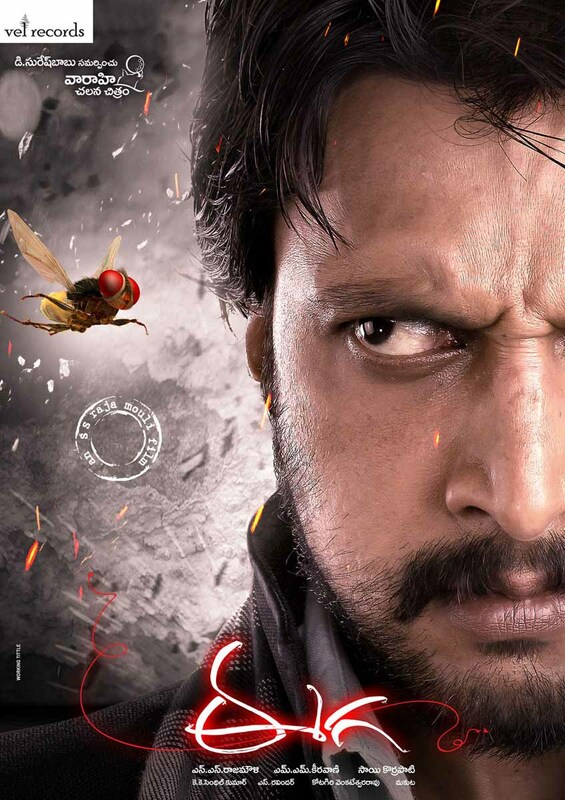 As Eega-Nani pestered him, Sudeep became less and less stable. Sudeep’s reactions to the fly were increasingly frantic and extreme but he melded it with gradual deterioration in his mental stability and health that made it good acting and not just slapstick. I imagine the direction went something like “ear, ear, nose, other ear! nose! gone..where did it go…gone, relax, EAR!!! !” His security team swapped guns for fly swats, his house became a fortress against bugs, his attire was more and more peculiar. The blend of comedy and threat is brilliant. There is nothing likeable about Sudeep’s character and yet I looked forward to his scenes. For the faint-hearted there is a scene requiring pixilation as Sudeep attacks the Eega with the only handy weapon – the pink towel he was wearing. It’s a wildly uninhibited scene and I laughed so hard I almost cried. Adithya (as Sudeep’s sidekick) did get the rough end of the pineapple in the hair department, having both the wavy mullet and the manband in play. His reaction to his employer’s insanity (and then proof of Eega-Nani’s unnatural abilities) was very funny. But the psycho villain’s sidekick has a precarious, and rarely a long, life. The supporting actors are not prominent, which is wise considering most scenes combine multiple points of view and there are some complex interactions. The camera follows Eega-Nani through all manner of mayhem and danger, and the choreography and planning of those scenes is meticulous.I really loved a moment when fragments of shattered glass reflect a fighter plane formation of flies surrounding Nani. It’s as dramatic as if a human film hero was in a fight for his life, and gets the adrenalin pumping. But it’s not all action and there are scenes that are just pretty or sweet. There are some very dark moments, but the message that killing a bad man to do the right thing is entrenched in Telugu film so I guess it wouldn’t have surprised the kids in the audience. 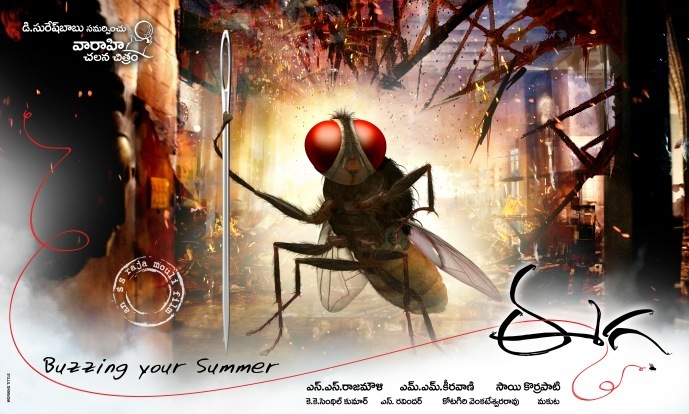 What made Eega work so well was the well plotted story and the restraint in using effects. The CGI served to further the story, and there was never a dull moment. SS Rajamouli has an impressive ability to get a story on screen and make it engaging. There are nods to other films and stars, and the Telugu heroic tropes all get a workout too. I have some quibbles, but they are insignificant on balance. The timing, the pace, the effects, the cast are all pitch perfect. Loved it! ReleaseDay is streaming Eega with subtitles so now you have no excuse not to see it! You will need to create a login to the site and it’s a festival print which I am told is around 20 min shorter than the theatrical release. You can also check out http://blog.releaseday.com/ for articles and news on Telugu films. Heather says: Loved it, loved it loved it! I’d read very little about this film and I’d only seen the trailer once, but when I saw a needle lightly indenting a cornea I knew this was going to be an excellent film for me. Plus it’s Rajamouli so of course it was always going to be a good story, and it didn’t disapoint. I do really like Nani, and I liked his rather self-sacrificing character here too. His one dance routine was fun and his obvious adoration of Bindu was quite sweetly portrayed. Nani did show some early signs of his engineering know-how by quickly constructing a parabolic light reflector from a satellite dish and an old chip packet, but his intellect certainly blossomed when he returned as Eega! Some of the ideas here were simply ingenious and Rajamouli totally captured just how irritating a fly can be, let alone one that’s out for vengeance. The CGI was of a very high standard and I was amazed at how easily different emotions and attitudes were conveyed by Eega-Nani. The fly charades where Eega-Nani made his requirements known to Bindu were hilarious and I have to say that she is much better at this game than I could ever be. In fact Samanatha was very impressive here as Bindu to the point that I didn’t realise who the actress playing Bindu was at first! I’ve never thought too much of Samantha as an actress in her previous films so it was a real revelation to see her put in such a fantastic performance here. I have a theory that similar to Shriya, her hairstyles have a lot to do with it. The longer and more curly Samantha’s hair is, the worse her acting and since here Bindu has lovely straight hair Samantha really shines in the role. This got me through the rather bizarre romantic scenes between Bindu and Eega-Nani since my reaction was more of a: ‘Samantha can emote – who knew!’ rather than concentrating too much on the fact that their relationship was never going to end well! Samantha also got some beautiful costumes to wear, and I loved her fringed tops which suited both her and her character very well. But despite Samantha’s amazing performance and even with the antics of Eega-Nani to contend with, the real star of the film was without a doubt Sudeep. He was brilliant in every scene and as Temple has described perfectly, the change as his initial evil and sinister businessman became very disturbed and unstable was superbly done. The scene with the towel was one of the best in the film (I’m laughing now even thinking about it) and his more and more frantic attempts to escape Eega were totally hilarious. Considering that Sudeep was in general having to react to a nonexistent opponent during filming, I think he did a fabulous job and his reactions were totally believable. I can’t think of anything in this film that I didn’t enjoy and I can’t recommend it highly enough. It’s easy to understand without subtitles and the many references to other films just add to the whole experience. Go! Watch! Enjoy! This entry was posted in Tollywood and tagged Adithya, Adventures without subtitles, Eega, Nani, Samantha, South Indian Cinema Induction Programme, SS Rajamouli, Sudeep, Telugu. Bookmark the permalink. Thanks. I am planning to watch it tomorrow. This movie has such an interesting concept! 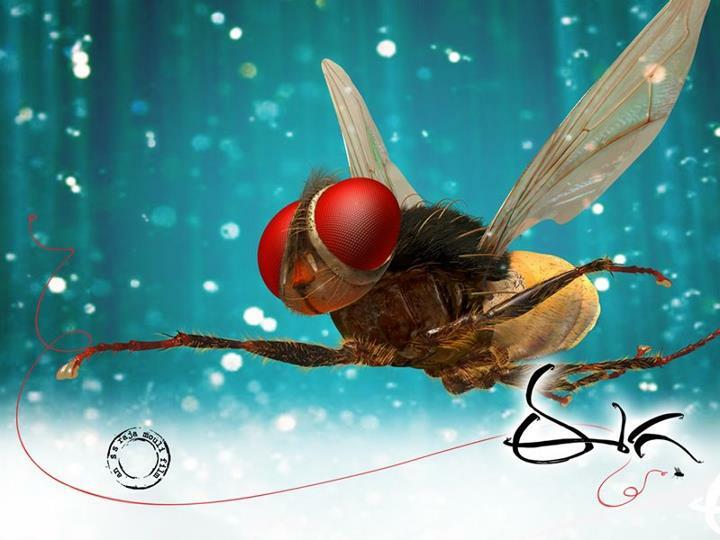 A human reborn as a housefly taking revenge for his death…sounds novel…I am glad that SS Rajamouli has created a good movie out of this concept…I am looking forward to watching the movie soon with English subtitles…thanks for the review Temple! This is a movie that sure takes Tollywood to new heights! Of course, some scenes were quite contrived and silly, but I laughed all the same. So guess I am not complaining. And yea, the aftermath is quite disturbing. Is Bindu never going to move on? What would happen if Eega dies and reincarnates as another animal!? These are the questions I pondered over as I left the theater! Hi Uday – I was wondering the same thing about his reincarnations! What if he came back as a spider (I would have splatted him with a shoe), or an eel or something less able to mime effectively. It made me think of this old Nike ad – The Angry Chicken! Lol! And I’m asking this out of curiosity…are there many 70mm screens where you live? Yes there are quite a few 70mm screens here. Most of the multiplexes have one or two in each complex and there are a handful of independent theatres as well. Thanks Saurabh. I agree SS Rajamouli is audacious in his vision, and he has the skills to translate that vision into an audience pleasing film. I was delighted by the cheeky humour in the characterisation of the fly, and all the thrills and spills. I was vaguely concerned about the mental health of a girl fixated on an insect but not enough not to enjoy Eega. So there was no bittersweet exasperation for me – just the sheer enjoyment.